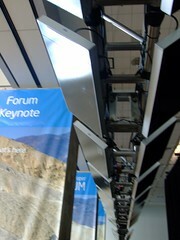 Slap-on arphids on everyone's badges, and over 300W of RFID scanners in an array over the entrance to the main conference hall in Moscone West. What's more worrying is that the branding on the RFID scanners means that there's a business in tagging conference attendees. Welcome to a whole new branch of the Surveillance Society. Time for the tinfoil hat badge-holder. Another million-dollar business idea waiting to be snapped up. What happens if you take off or cover the arphid (nice term) after you enter the hall? Are you surrounded by a swarm of security staff? Or if you happen to have two RFIDs next to each other? If its anything like the one in my Oyster card, they'll jam each other. Yes, and the terrorists get to their targets that much quicker. Well the point is that if the RFID passport would let them through the RFID scanner lane without alarms going off, it'd let them through the much slower manned security lane as well..
Well yes, but you with your five parking tickets end of on the no-fly list. Or, you having escorted a woman to an abortion clinic, are also on the no-fly list, or you, having made a major pay-down of your mortgage are also on the no-fly list while homeland security determines whether your legal actions are potential terrorist tactics. Meanwhile, the careful terrorist gets to the plane. Boom. At least you lived. I would have thought there is a demand now for a pen size electromagnetic pulse device as an opt-out measure.